In the summer of 1957, Sibelius dictated new arrangements of Kullervo's Lament and the song Kom nu hit, död at the request of the singer Kim Borg; Jussi Jalas wrote down the notes. Sibelius showed that he was still fully able to work: there was nothing wrong with his brain, although his hands shook so badly that it was very difficult for him to write down notes. In September, a flock of cranes were saying goodbye to Finland. One of the birds flew over Ainola, so close that the composer saw a crane for the first time in years, despite his cataract. "There they were, the birds of my youth," Sibelius said joyfully. On the 20th September, Sibelius felt dizzy when he woke up. Nevertheless, as he lay in bed he scanned through the daily newspapers, as was his habit. At one o'clock, in the middle of breakfast, he collapsed. Sibelius still had the energy to say that he recognised his daughters, Eva Paloheimo and Katarina Ilves, when they arrived. At nine o'clock in the evening he passed away. At the same time, Malcolm Sargent was conducting the composer's fifth symphony in a concert broadcast from Helsinki. On the following day, Eva Paloheimo made an announcement that surprised many: the eighth symphony did not exist. The family knew of no unpublished works. To be sure, several minor unpublished works were found later in Ainola, but there was no trace of the longed-for symphony or any other major new work written after the 1920s. The obituary notice on the 24th September startled many. Aino Sibelius had chosen as a text "Music is made from sorrow", apparently following the wishes of her husband. On Sunday, 29th September, there was a small memorial service in Ainola, in which Jussi Jalas played The Song of My Heart and Prospero's music from The Tempest. After the ceremony the composer's coffin was carried to a motor hearse. In Helsinki, the musicians of the Helsinki Philharmonic Orchestra and the Radio Symphony Orchestra carried the coffin into Helsinki Cathedral while Tapani Valsta played Bach on the organ. Before nine o'clock in the evening the cathedral was opened to the public, and it remained open until midnight. During this time 17,000 people filed past the coffin to pay their respects. Students stood guard all through the night. The funeral took place on Monday, 30th September 1957. The funeral music consisted of two hymns composed by Sibelius, three sections from the music for The Tempest, The Swan of Tuonela, Il tempo largo from the fourth symphony, and In Memoriam. After the funeral service, Aino Sibelius and President Urho Kekkonen laid their wreaths. Influential musical figures, including Uuno Klami and Einojuhani Rautavaara, carried the coffin to the hearse. The freemasons among the cortège were startled when they recognised a familiar tune. It was Marche funèbre, from the ritual music that Sibelius had composed. People formed a guard of honour at the roadside from the centre of Helsinki to Järvenpää. At Ainola, the relatives carried the coffin to the terrace which had been chosen as the burial place. The composer Erik Bergman signalled to the choirs which had been summoned for the occasion. Once again The Song of My Heart was heard. At the grave, Aino Sibelius looked more fragile than ever before. Few could guess that she would survive her husband by more than a decade, dying in June 1969. Aino Sibelius laid her last greeting on the grave. The funeral ribbon read: "From your own wife, in gratitude for a life dedicated to your great art." 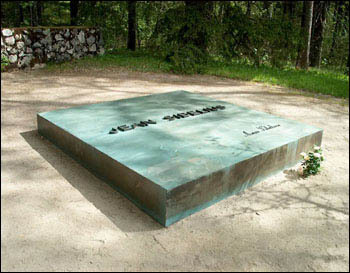 Jean Sibelius's grave in the courtyard of Ainola.